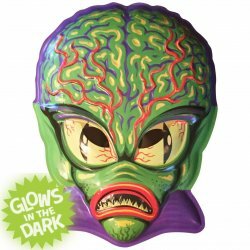 Crawling out of a 1950s drive in-movie and invading your home, this alien invader will not rest until we're all exterminated! Stay vigilant! Watch the skies! Glow-in-the-Dark Space Invader is from the Ghoulsville Series 2. COLLECT THEM ALL!